Formed by 85 islands covering an area of 2,700 km², located between the States of Piauí and Maranhão and opening into five arms, the Delta do Parnaíba, or Delta of the Américas is a watery landform that is as striking in its sheer breadth as the deltas of the Nile or Mekong. The mixture of rivers, mangroves, dunes and desert beaches are home to an extraordinary abundance of unique flora and fauna as well as a large variety of birds. The Delta is best explored by boat spending about 1-2 days cruising for example from Parnaíba to Tutóia (or the opposite direction) with an overnight stay on Ilha do Cajú, one of the outstanding islands in the Delta. Alternatively, Ilha dos Poldros also offers accommodation. It is worth noting that the rainy season lasts from March until August. This is the best time to visit Delta do Parnaíba, when nature becomes alive. 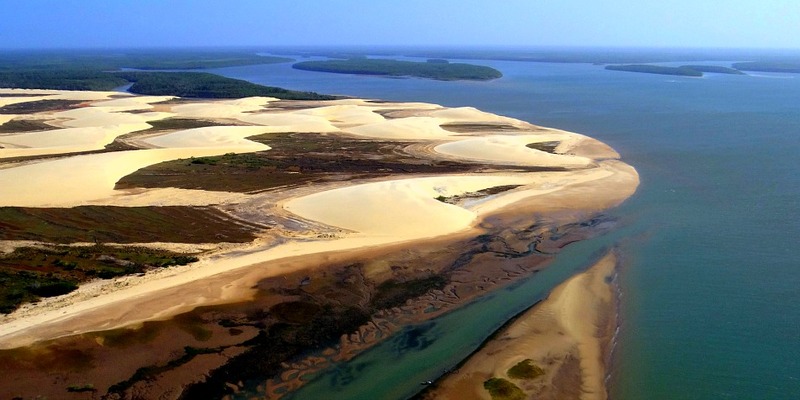 The Delta do Parnaíba is half way between the Lençóis Maranhenses and Jericoacoara on the Rota das Emoções (Route of Emotions).